So what is the Sleekens Photoshop workflow? Lets start with what a workflow really is. A workflow is just a process of steps you follow to achieve your task. In photography terms, it is the steps you take to get your image from your camera into your image catalogue, edit it and then finally output the final version. When you search for Photoshop Workflows, you will get Literally hundreds of results, all claiming to save time and promising spectacular results. So what does a Photoshop Workflow actually entail. A Photoshop Workflow is actually making use of the Actions tool. For those unfamiliar with Actions, there are plenty of tutorials to be found online. 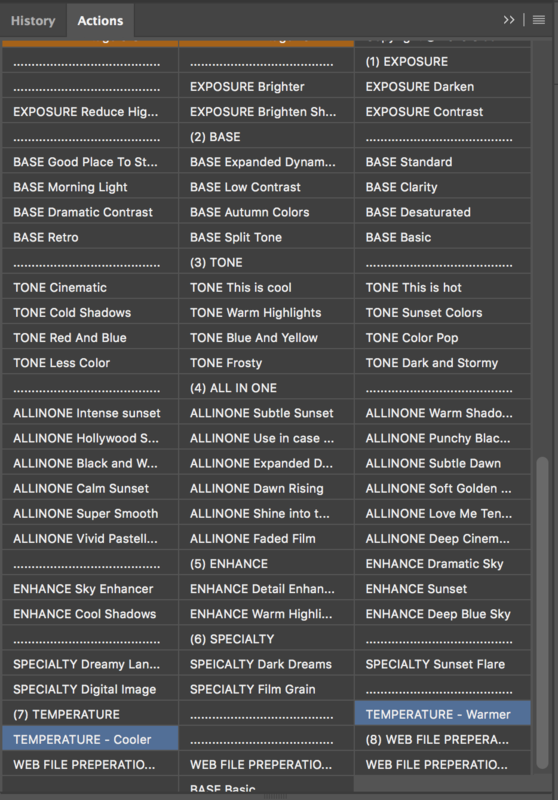 The Sleekens workflow consists of 56 Photoshop Actions broken into 8 groups for ease of use. Each Sleekens action will produce a particular look. The layer can then be refined and built upon. Multiple actions can be used consecutively to build the desired look. This video also shows you how to use the actions to great effect. The download includes instructions on how to install the workflow file which very straight forward. You spent the actions panel in Photoshop, select load actions then select the .atn file from the Sleekens download. If you are unsure how to install actions in Photoshop, watch this video guide. Once the workflow is installed, open your image in photoshop. You then access your actions by selecting View then Actions. To apply a desired look to your image you select the appropriate action from the list and it will complete a series of steps, immediately changing your image. In some cases you have to select the base layer before the action will run. When this occurs, you will need to either flatten your image or create a stamped visible layer (CMD/CNTRL+OPTION+ SHIFT+E) and select that, the try to run the action again. Once the action has run you are then able to refine the look by making changes to the layers that were created, apply layer masks or change the layer opacity. I spent a few hours playing with these workflows to try and get a good feel for what I could produce and how quickly I could get there. I used 3 different Images and tried multiple combinations on each, producing a different final images each time. In almost every instance the effect was very strong and I ended up reducing the opacity of the layer to less than 40%. Like most Photoshop work, it is best to apply subtle changes and use masks to confine the changes to specific areas of the image. On the Image below I spent about ten minutes to go from what it looks like on the left to the final image on the right. I started with brighten shadows to bring out some detail in the foreground, I hid this from the sky with a layer mask. I treated the sky with a dramatic sky adjustment and brushed it into the sky. Following that I gave the colours of the whole image a boost with colour pop. Next was bringing out the details in the image with clarity. This I selectivity brushed out to reduce it in areas where I felt it was to strong. Finally I needed to correct the magenta hue with a hue saturation layer. One specific frustration for me is the actions often didn't preserve previously created layers. This prevents me from going back and making tweaks as I build up the look. Often the images needed to be flattened before I could run the action. I tried to overcome this by applying a stamped visible layer. Despite my reservations, the resulting images can be bought to life quite quickly with pleasing results. I was able to improve lighting and colour without introducing artefacts, such as noise or colour banding. I did have to colour correct the image and I could have spent more time and effort doing so, but that is not the point of this review. These actions are not going to be for everyone. To get the best benefit out of these workflows, you will need to become thoroughly familiar with what each one does, and be happy to make basic tweaks and move on. I feel as if they are a great tool for a novice user who is trying to discover what Photoshop can do, or the time poor pro who doesn't feel like creating their own and needs to push out quick edits. For me I prefer to do this type of editing in Lightroom I generally go to Photoshop for the more considered and precise work. Despite my reservations, the workflow does everything as advertised and I can't fault it for that. Going forward i’m not likely use too many of the actions in the future, as I prefer to have more control over my layers, though I will continue to give them a go. Who knows, maybe I will grow to like them. Follow the links to find out more about what Sleekens have to offer, Photoshop Workflows for for portrait and landscape editing Lightroom workflows as well as a photo editing service.